The author of the mural is La Puerta, a collective of local artists who use public spaces to express their message of protest. 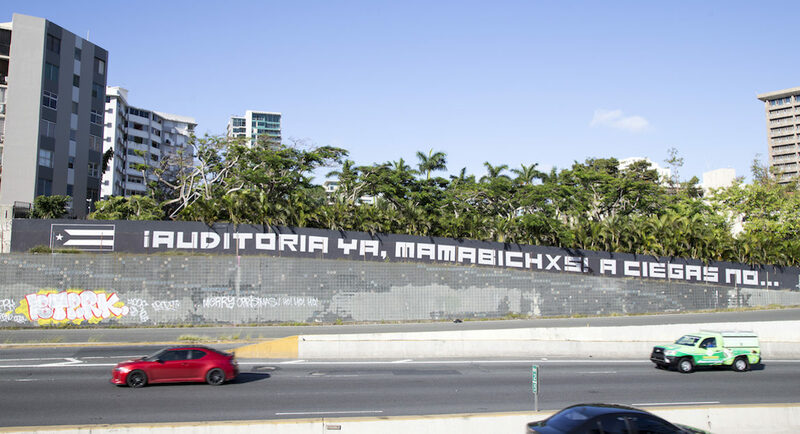 A mural alongside Baldorioty de Castro Avenue in San Juan, near the exit to De Diego Street, reads nowadays, “¡Auditoría ya, mamabichxs! A ciegas no” (which roughly translates into “Audit Now, suckers! Don’t do it blindly”). Its message refers to Puerto Rico’s public debt: the island still waits for an audit of the billions of dollars in debt issued by the Government and over which it still owes more than $70 billion, which adds to another $50 billion owed to its pensioners. The lack of this exercise becomes more urgent these days. The island’s federally imposed Fiscal Control Board (FCB), the local government and Puerto Rico’s main creditors are negotiating behind closed doors the largest debt restructuring of the U.S. municipal bond market. Last week, a preliminary agreement was announced that would end a key dispute in the island’s bankruptcy process. Almost half of Puerto Rico’s 11.5% sales tax is committed to the payment of debt issued by COFINA, a public corporation. Since the beginning of the island’s bankruptcy and allegations of illegality over COFINA debt, both the government and its bondholders have been at odds over who owns the money of the sales tax. Will Puerto Rico sign off on restructuring deals without a comprehensive and independent audit of its debt? In addition to countries such as Ecuador, Brazil and France, U.S. jurisdictions such as Detroit and Jefferson County, Alabama, argued the illegality of part of their debt during their restructuring processes. It left these governments in a better position to negotiate with their creditors and thus free up more resources to essential services. Several actors seek to investigate Puerto Rico’s public debt and the island’s fiscal woes. Not all have the same scope, purposes, motivation or resources to do so. The Puerto Rico government already admitted that some of its debt is illegal. Late last year, its lawyers argued in court that bonds issued in 2008 by the Employees Retirement System (ERS) were null and void since ERS “was never authorized to issue debt,” which amounts to more than $3 billion. 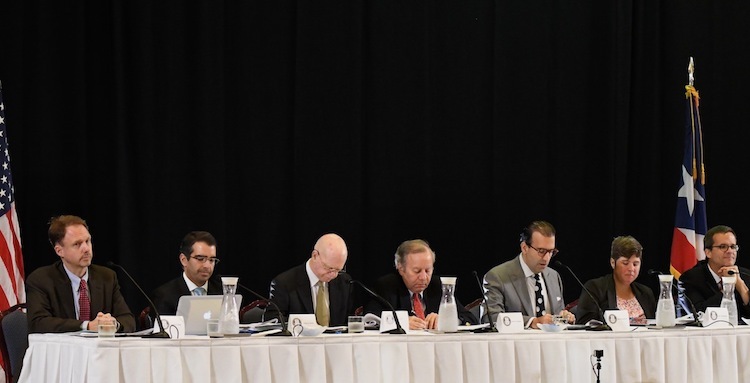 A legislative commission, moreover, released two preliminary reports in 2017 that found possible illegality of several debt issues for violating provisions of the Puerto Rico Constitution such as staying within the constitutional debt limit and maintaining balanced budgets. The seven members of the JCF during their first meeting in Puerto Rico in November 2016. However, the FCB insists it is the only entity with the authority to claim in court any illegality over Puerto Rico’s debt as the representative of the Government in its bankruptcy process under Title III of PROMESA. The FCB says it conducts its own investigation on the island’s public debt since September 2017. Puerto Rico’s fiscal czar vows it carries out a comprehensive investigation and that it would litigate any cause of action that may arise, including whether some of the debt is illegal. Yet the process managed by the investigator hired by the FCB, John Couriel of Kobre & Kim, leaves out important “internal documents,” such as emails, from the financial institutions that played a central role in the island’s debt transactions, according to a group of government creditors. Although it was expected to be ready last April, the FCB still waits for the final report by Couriel, a former federal prosecutor and former candidate to the House under the Republican Party. Couriel is now expected to reveal his findings by mid-August, FCB attorneys said during a June 6 hearing on Puerto Rico’s bankruptcy case. A second approach takes place in Federal Court, where a group comprising two labor unions, government suppliers and the trustee company of now defunct Doral Bank, seeks to investigate Puerto Rico’s debt as part of the Title III bankruptcy process. 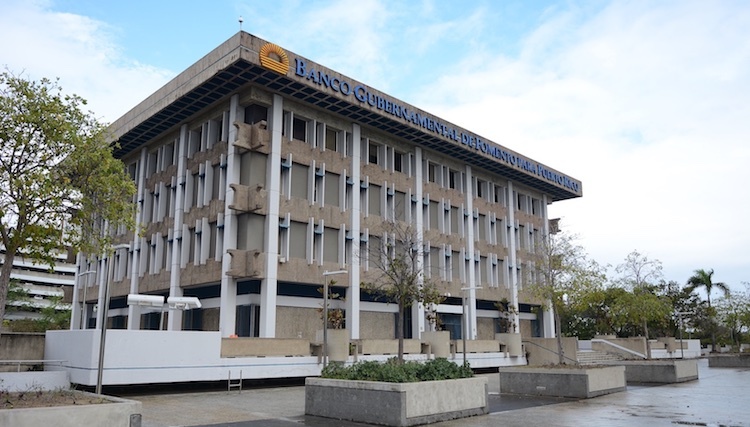 The investigation sought by the Unsecured Creditors Committee (UCC) centers on three financial institutions: the Government Development Bank (GDB), Banco Popular and Banco Santander. Last November, the court rejected the UCC’s first petition to obtain documents and evidence from these banks, leaving the investigation in the hands of the FCB, in coordination with the UCC and the committee that represents government retirees. Both groups would have access to the information collected by the FCB investigator, subject to confidentiality agreements. In the case of the GDB, “we have received zero documents,” said Despins, adding that it only shares information with the FCB investigator under strict confidentiality. The entity that served as Puerto Rico’s fiscal agent for more than seven decades signed an agreement with its creditors to restructure its debt under Title VI of PROMESA. These bondholders—mostly local credit unions and hedge funds such as Avenue, Brigade, Fir Tree and Solus—stand to receive up to 55 cents on the dollar of the GDB debt they own. The UCC attorney said there was no deal on confidentiality agreements with the government bank, so the committees still lacked access to the information related to the GDB. Lawyers for both committees also warned they have little or no participation in the FCB’s debt investigation, as well as no access to information provided to the FCB investigator by other financial institutions and parties. This is why the UCC seeks once again to receive permission from the court to carry out its investigation into the GDB, Popular and Santander. The FCB, the Government and the two banks oppose the petition. They argue the UCC must wait until the FCB’s investigation is completed, which is now expected to happen by Aug. 15. “I can bet my money that [date] it’s not happening,” said Despins during the June 6 hearing. Magistrate Judge Judith Dein, who assists in the Puerto Rico bankruptcy cases, will hold a hearing in Boston on June 18 over the UCC’s petition. Dein already warned that the committees would have access to part of the GDB documentation given to the FCB investigator. However, the information would be shared confidentially. A third effort is led by Frente Ciudadano por la Auditoría de la Deuda (Citizen Front for the Debt Audit), a multisectorial group that denounces that Puerto Rico still negotiates with its creditors under the premise that all debt is legal, without knowing if that is the case. Its objective is a complete, thorough audit of Puerto Rico’s debt: how much it really amounts to; what was the use of bond proceeds; what was the performance of the different actors; and whether it was done legally. “We know there will be some cuts [or reductions] to the debt, but they would be based on the premise that all the debt is legal. What would it be like if there was an audit? 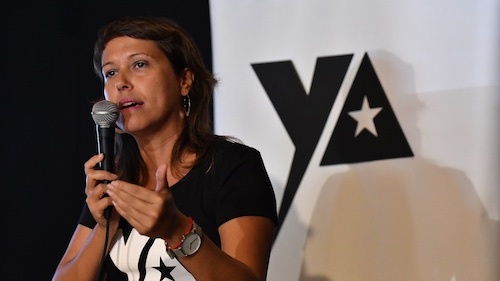 Where would have we started to negotiate?,” questioned Eva Prados, a lawyer and spokeswoman for el Frente, after a public presentation on the importance of auditing the debt at the Cayey campus of the University of Puerto Rico (UPR). Through a campaign called ¡Auditoría YA! (Audit Now! ), el Frente counts on the support of the people to finance its proposed citizen debt audit commission. For the first phase, it seeks to raise $500,000. The multisectoral group recently ramped up its orientation, information gathering and fundraising efforts. Almost a month ago, el Frente required the Financial Advisory & Fiscal Agency Authority (AAFAF by its Spanish acronym) to provide information on past debt issues, particularly that of COFINA, which is backed by sales tax revenues. Two years ago, AAFAF took over GDB’s fiscal agent role amid the bank’s financial debacle. “Besides a simple response that they are evaluating our request, they [AAFAF] have not given us information,” Prados said. It is the last chance, according to the spokeswoman, before the group takes the matter to court. “We will continue with the process and we are evaluating the possibility of a mandamus to start the litigation process, but not before giving the government an opportunity. We have been sending several letters requesting that space,” she added. For Prados, the decisions and the direction that the bankruptcy process is taking under Title III, “where access to information is also being limited,” are alarming. “Instead of seeing this debt issue as a public matter where all the actors must give the necessary information to the people of Puerto Rico, it is just the opposite,” she noted. El Frente presents its proposal as an alternative to the inertia and slowness shown by the government. It questions the lack of independence, the resistance of economically and politically powerful sectors, and the lack of urgence to protect the interests of each Puerto Rico resident, not of a few. The idea of auditing the debt through a citizen commission emerged in 2017, when Gov. Ricardo Rosselló Nevares eliminated the Commission for the Comprehensive Audit of the Public Credit, a legislative commission created in 2015, comprised of 17 members representing different sector, and with an annual budget of $2 million. Delays in its establishment and in the disbursement of funds—as well as fierce opposition of officials of both parties and the administration of former Gov. Alejandro García Padilla—were some of the biggest obstacles of the commission, sources told the Center for Investigative Journalism (CIJ). “They’d tell us we were carrying out a blue-ribbon [panel] such as [former Gov.] Sila María Calderón’s against [former Gov.] Pedro Rosselló’s officials,” said one source with ties to the repealed legislative commission. “It was never understood that the main objective was the banks and insurers mafia, so [the government] delayed everything,” the source regretted. The FCB’s investigation doesn’t have the same objective of the comprehensive audit sought by el Frente and its citizens’ commission, a proposal anchored in the models undertaken in Ecuador, Brazil and France. Nor does it pursue the same goal as the investigation proposed by the UCC. While the creditor committee focuses its efforts on the responsibility of the financial sector in the island’s fiscal crisis, the citizens’ commission would evaluate all the actors; not only those among the financial sector, but also in the federal and local governments, Prados explained. This is part of a comprehensive audit, but not the complete exercise, noted José Caraballo Cueto, an economist and professor at UPR Cayey. “What the UCC is looking for is a forensic audit exclusively on the banks. That is, to evaluate the role played by the banking sector in Puerto Rico as an intermediary with its debt. That’s part of a comprehensive audit, but it’s not all,” said Caraballo Cueto, who is also president of the Puerto Rico Economists Association. As for the FCB’s investigation over the island’s debt, its scope has been called into question: Does it really seek to identify causes of action that could allow a court to declare part (or all) of Puerto Rico’s debt as null? During the June 6 bankruptcy hearing, Timothy Mungovan, an attorney for the FCB, assured that the FCB’s investigator will include in its final report a complete list of potential causes of action and possible “avenues for recovery.” Both the UCC and el Frente agree that the FCB’s investigation will fall short. “How can we trust it?” questioned Prados during the forum at UPR Cayey. She referred to the ‘independence’ of the FCB’s investigation given the host of relationships that exist among people linked to the probe and the possibility of conflicts of interest. In the case of the UCC, the group expects from Couriel a final report similar to the one released last April by the U.S. Government Accountability Office (GAO). Instead of adding to the discussion, the federal agency reaffirms in its report well-known causes of Puerto Rico’s fiscal mess. It mentions possible corrective actions, such as greater regulatory control and eliminating triple tax exemption on these bonds. For Caraballo Cueto, GAO’s report is “a sloppy job,” which leaves out the role of the municipal bond market and Wall Street in the island’s fiscal crisis. At the federal level, the Puerto Rico government has been subject to investigations by the Securities & Exchange Commission (SEC). The agency, however, remains silent to date on this matter and even closed one of the investigations—over the $3.5 billion in general obligation bonds issued in 2014— Reuters reported. On the private sector side, banks such as UBS, Popular and Santander have settled during the past five years more than $330 million in securities arbitration cases mostly related to Puerto Rico bonds. Jim Millstein, a former financial adviser to the Puerto Rico government, once said that he had never had a client with such creativity to issue more and more debt. Puerto Rico tried everything: general obligation bonds; revenue bonds; capital appreciation bonds; credit lines; tax revenue anticipation notes; bond anticipation notes; loans between government entities; subsidized bonds; variable interest bonds; special vehicles; securitization; and interest rate swaps. “There are powerful interests behind all this, behind the scenes, and this would open a Pandora’s box. [The audit of the debt] is something that is not wanted,” said Caraballo Cueto, who along Juan Lara, another economist, recently published the findings of their research on the causes that led to excessive indebtedness in Puerto Rico. “Transparency is the least that can be demanded,” the economist added.